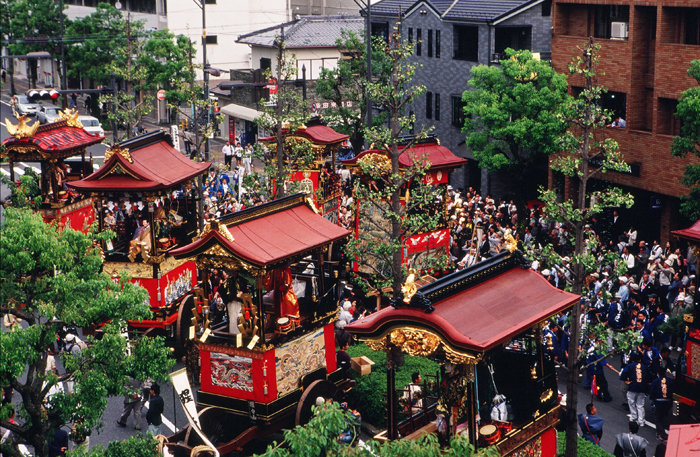 One of Shiga’s largest three festivals, the Otsu Hikiyama festival is a stunning display of elaborate Mikoshi and parades through the city streets. The festival celebrates Otsu as a successful modern industrial city and showcases the prosperity of the townspeople. It has been named a Shiga Prefectural Intangible Cultural Property as it has a history of over 400 years and is attended by people from all over the prefecture. One of the unique elements is the use of tanuki masks by participants, a tradition which dates back to the very beginnings of the festival. There are thirteen floats to be paraded by local residents, along with music and chanting and the festival is led by the Saigyo-Sakura-Tanuki from Kajiya-cho district. The night before is a lively affair of music and dance with a buzzing atmosphere in preparation for the day ahead and is just as enjoyable, if not more so, than the parade itself. Saturday’s schedule starts at around 6pm and Sunday’s activities start at 9.30am until 5pm.